The placement process commences at the end of third year with the compilation of the profiles of the students who are ready for placement. Mock interviews and simulated group discussions are conducted to prepare the student for the final interview and screening process. The companies are invited into the campus for pre placement talks from India and abroad. Students are shortlisted by the HR of the recruiting companies based on written tests, group discussions, and final interview as per the selection procedure being followed in their organization. 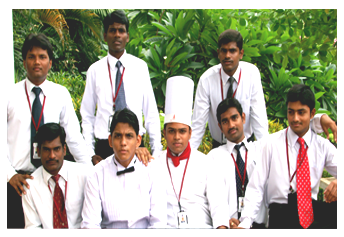 We at IAST are committed to preparing the students for immediate placements in well-established lavish hospitality firms such as Hyatt, Marriott, Windsor Manor, LeelaKempinski, Tajin India and abroad. A placement department comprising of all key personnel namely Principal, Vice Principal and senior faculty members take care of internships and placement process for the students every year. Students begin their careers as assistant chef, management trainees, and operation trainees and then grow to the positions of Front office mangers, FnB managers and even General Managers. 70% of them have settled abroad in good properties. About 5% of them have turned entrepreneurs managing their own restaurant, hotels and facilities services companies. The programme allows the student to explore even wider avenues like event management, travel management, tourism, BPO without limiting the career scope just to hotels and restaurants.